As much as we are trying to stay away from too much red meat, kalbi is the one exception that our family can all agree on. Korean-style beef short ribs, kalbi (or galbi) is very simple to prepare and cook. Perhaps the most difficult part is finding a butcher to cut them correctly (if you live near a Korean grocery store, it is sold in large 3 lb packs usually). Korean-style beef short ribs contains 3 ribs and are cut across the bone about 1/2″ thick. You may be familiar with the large rectangular kalbi favored at Korean restaurants, but I find three-rib style cut much simpler for home cooking. 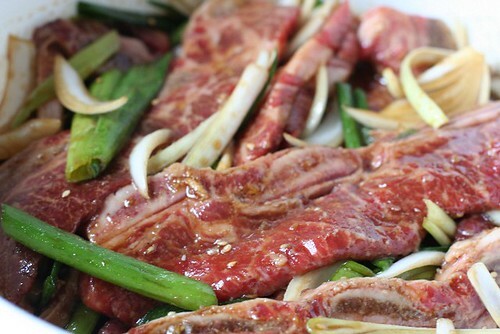 Kalbi is most delicious grilled, but it can also be pan fried or broiled in the oven. The traditional way to eat kalbi is wrapped in red leaf lettuce leaves or perilla leaves (geneap) with a little rice and a bit of ssamjang. Ssamjang is a combination of fermented bean paste (tenjang or Korean miso) and and kochujang (Korean red pepper paste) with minced garlic, sesame seed oil and chopped scallions. 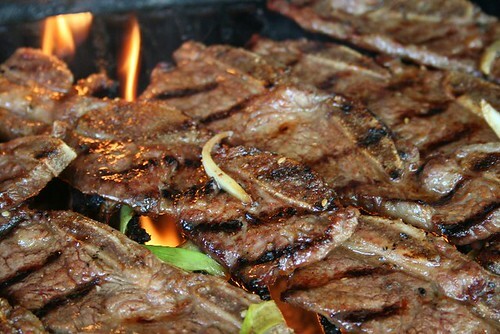 However, Kalbi is just as delicious served non-Korean style à la big slab a meat on a plate. 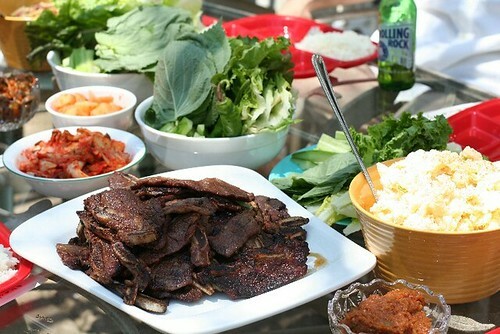 A barbecue at onespicymama’s house – kabli served with (clockwise from top left) kimchi, pickle kimchi, radish cubed kimchi, perilla leaves, fresh Korean cucumbers, fresh Korean hot peppers, red leaf lettuce leaves, potato salad and ssamjang. Oh, and some Rolling Rock. Combine soy sauce, sesame seed oil, water and sugar in a large bowl. 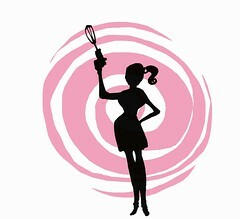 Whisk until sugar is dissolved. Add garlic, onion and scallions and combine. Add short ribs and make sure to coat both sides with marinade. Refrigerate for at least 1/2 hour, but preferably a couple of hours. After pre-heating grill well, cook short ribs about 3-4 minutes per side on medium high. The biggest dilemma is how to cut up the meat into manageable sizes for placing inside a lettuce wrap. I find kitchen shears work magic on kalbi. And what of the bit of meat around the bones? Most Koreans would say that’s the tastiest part. This is one of my kids faves. We have it about once evey couple months. I hope many decide to make it at home, it is such a fun meal to eat with the family. So yummy looking! My prob is getting the cut of meat that I want. Cuz the malay uncles usually don’t get what I mean! Now with gas prices the way they are and where we live, I haven’t had any for more than 6 months. I want some pulgogi and kimbap!! Your blog is brilliant. I have taken notes of your stews. I will return to visit you. That is some mouth-watering meat in that picture. Too bad I jumped on the Vegetarian bandwagon a few months back. Otherwise I would be all over that stuff with a bib on and a bottle of wet naps. Great site, we did korean bbq at home too! Beautiful, and egg/dairy/peanut free for my kiddos! I have some perilla in the garden, so I really should give this a go. My meme is up, thanks for the tag! One suggestion is to put some 7up in the marinade. My mom’s Korean friends say that it’s the ‘secret ingredient’ that helps to tenderize the meat. Mmm Kalbi! What a beautiful post. Thanks for tagging me for the meme. Mine is up (and lengthy)! Yum! I loved making Kalbi while in Seattle but can’t find a buthcher to cut the meat correctly down here in Texas — course it could be so few Asians down here. Kalbi was always a family favorite, so will continue trying to get my butcher to work with me. Try it, you’ll love it! You’ve done a great job, and i appreciate it, thank you very much my freind. Keep the good food flowing!